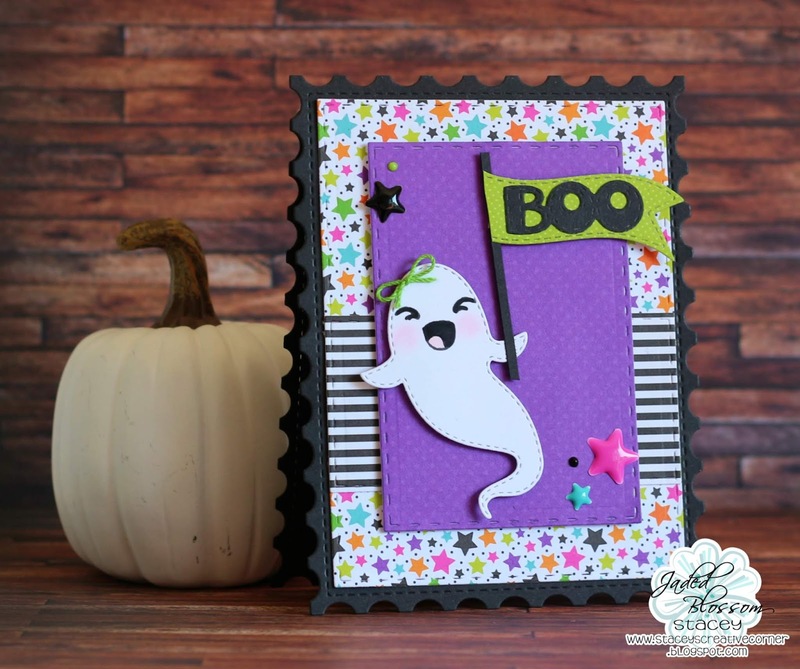 Stacey from Stacey's Creative Corner with you today sharing a fun Halloween card that I made using those awesome Jaded Blossom stamps and dies! I used the Postage Dies to create my card base from some black cardstock. I created my stitched layers by using the Rectangle Dies 2. I cut a fun little ghost from the Halloween Dies and gave her a sweet little face from the Pumpkin Faces stamp set. I created a little sign for her to hold by using the Mini Tag Dies 2, Halloween Dies 2 and a strip of scrap black cardstock. I popped up my ghost and sign with some foam tape onto my card front. I finished off my card with some enamel stars, Nuvo drops and a little crochet bow., Adorable!! Fall Coffee Blog Hop and Stamp Release! Keep Calm and Eat Candy Corn!